[New] The March 2019 issue is now available. 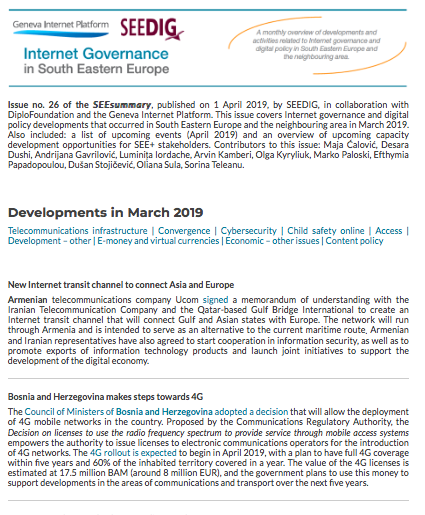 It covers Internet governance and digital policy developments that occurred in South Eastern Europe and the neighbouring area in March 2019. Armenia: New Internet transit channel connecting Asia and Europe to run through Armenia. Azerbaijan: Around 700 schools in remote villages will be connected to the Internet. Belarus: President Alexander Lukashenko approves the country’s Concept of information security. Bosnia and Herzegovina: The Council of Ministers adopts a decision that will allow the deployment of 4G mobile networks in the country. Romania: Senate approves draft law aimed to create a regulatory framework for ride-hailing services. The draft still has to pass the Chamber of Deputies. Serbia: The Serbian Securities Commission launches a public consultation on crypto assets, while Telekom Serbia is licensed to issue e-money. Ukraine: New sanctions list provides for blocking of online resources. SEE+: Facebook removes fake accounts in and Kosovo*, North Macedonia, Romania and Russia. Also included: a list of upcoming events (April 2019) and an overview of upcoming capacity development and engagement opportunities for SEE+ stakeholders. Editors: Adela Alexandru, Qanita Abedpour, Maja Ćalović, Desara Dushi, Andrijana Gavrilović, Su Sonia Herring, Loreta Kroj, Olga Kyryliuk, Marko Paloski, Efthymia Papadopoulou, Mirko Savković, Oliana Sula | Coordination: Sorina Teleanu.